Marquise Knox is a once-in-a-generation type of talent. And, man, are traditional blues lovers lucky he's decided to pursue straight-up real blues. Marquise has the voice, the songwriting talent, the guitar chops, the showmanship and the determination to very likely be a success in any number of styles of music. But for Marquise, it's nothing but the blues. Not the guitar hero, pyrotechnic licks blues. Not the gimmicky, tired, "Sweet Home Chicago" meets "Mustang Sally" predictable blues. No, Marquise almost seems to be literally channeling the certain-something energies and nuances of a Howlin' Wolf or Muddy Waters or Lightnin' Hopkins. In fact, when you listen to Marquise - 19 years old when he recorded this title - you get the sense that this is what those masters must have sounded like as young men. Marquise's blues are so transparent and bare. It's so easy to feel his music as totally legitimate. That's above all what makes it so appealing. That's what makes Marquise Knox special. He's the whole package. A throwback blues master on the rise. Anybody believe in reincarnation? As you'd expect from somebody still so young, Marquise's talents have matured immeasurably since his 2009 APO debut, Man Child, recorded when he was 16. And that was a really good record. 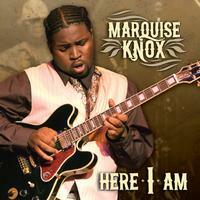 On Man Child, Marquise shared the guitar duties with Michael Burks, a fiercely explosive and powerful guitarist. For his new record, Marquise doesn't need the guitar help, and Here I Am doesn't want for even a little power and punch. Marquise's guitar skills have improved tenfold. Seriously. And his voice is, well, three years richer. To say that this record sounds unlike anything any other 19 year old is releasing in 2011 is undisputable. To say that it may be unlike anything anybody is releasing in 2011 might also be true. When Man Child hit the market in 2009, blues lovers freaked out partly because of how young Marquise was to be sounding like such an aged veteran. Well, he's still awfully young, but this time around, the focus ought to be entirely on just how incredible a bluesman Marquise Knox is, age aside. 8. Can A Young Man Play The Blues? This is the only new blues i own, this guy sounds right/traditonal for all the right reasons. Incredible sounding pressing, get this one before it's gone or the price goe's up. not exactly easy to find elsewhere at a good price. This is THE source for marquise knox. I play this everyday, its that good. check him out on youtube....the best!